In this society, especially in my millennial generation, I hear a lot of talk about women wanting to be #bossbabes and independent women. I don’t hear much about the beauty in making sure we are ,at the least , overseeing the caretaking of our homes, making sure that we have a meek and graceful spirit, and making sure that we are loving our husbands and children. Helping Note: Dear Sis, there is nothing more beautiful than a Godly woman who takes care of her home. A man looks for a woman who has the ability to arrange the administration of the house around the vision that God has given him as the man of the house. When God created Eve, He designed her to be the help suitable for what Adam was called to do and become. Adam’s main job was to “keep” the garden. However, there were other responsibilities to ensure his successful upkeep. This is why God said it was not good for Adam to be alone and then he created a wife for him who’s very first purpose was to be the help compatible for his assignment. It is no coincidence that Titus 2:5 calls the woman the “keeper of the home”, directly associating her to man’s first responsibility to “keep” the garden. It means that the wife of a man must make it her aim to fulfill her original assignment which is to accommodate her husband’s mission in life with class. Being “Keepers of home” means to be domestically inclined, or a good housekeeper. In other words, that means “honey, you are officially a home manager”. Remember , it’s not a duty…it’s an honor! The keeper of the home constantly takes inventory to make sure that you are aware of everything in the house. I realize that the fluidity of my house running like a well-oiled machine begins with me. 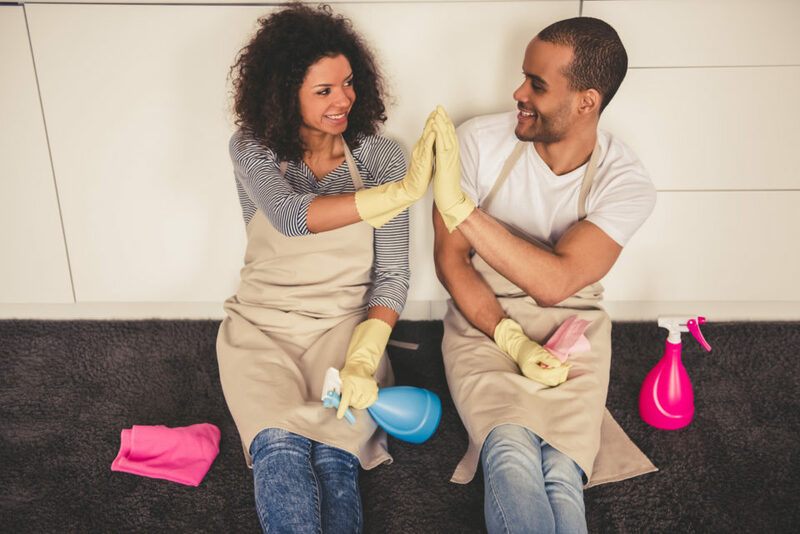 Whether you’re married or single, take a moment and look around your home today and comment one thing that you can do to make it cleaner, neater, or more organized. I can’t wait to hear all about it! Also, I’m sure my free weekly planner can help. Click here to get that if you haven’t already, and also stay tuned to some very important announcements this week. I’ll be going live on my facebook page this week, so click here to like the page so you can stay updated. And, If you’re a lady ready to Create order from disorder in your lives and minds, click here to sign up for my FREE webinar that I’m hosting this week. Tell a friend as well! I believe you will enjoy! Amen this is good!!! I just started orgsnizing my house and writing things down I need to do. thank you and that’s awesome ! I KNOW I could do a much better job about organizing my clothes! I’m the world’s worst about washing clothes and leaving them in the basket unfolded or even folding them and never putting them up! I’m currently single but this is definitely something I should work on before getting married and having kids as I will have much more laundry then!….Great post! Sometimes it’s hard joggling your work along with taking care of the kids and wifely duties so I’m not ashamed to say chores get done on time or everyday. Yeah I try to do what I can, but whenever the opportunity comes around I just stay in and do what I need to do to put my house in order. I do recognize what needs to be done but sometimes I just can’t do it right away. Good read tho! Oh yes definitely! What helps me is assigning a chore or two to each day of the week. It really helps creating habits. And also, I try not to be too many things on my to do list, because they definitely won’t all get done! Hope you will join us on our 21 days of organization! Thanks Amanda for this much needed post! As a mom to small twin girls and working husband, I find it hard to “keep this machine oiled, up and running” (organizing, cooking, cleaning and running errands) not to mention my own appointments. But your post help put things in perspective for me. I am working to improve because I do want to give my family what they need. Blessings to you and your family. It’s definitely challenging! First thing, don’t beat yourself up. Secondly, what helps me is assigning a chore or two to each day. Like every Sunday, I change linens. On Monday, I mop. and etc. I’ve learned that trying to do everything in a day can be completely overwhelming! I’m sure you’re doing great! Hope to have you join us on our 21 days of organization challenge. This is awesome. I’m single and always on the go, when I’m home sometime I tend to get lazy. Then I’ll say well, I’ll clean tomorrow, then tomorrow comes and I always end up making another excuse. This has definitely encouraged me to do better. Thank you. Happy to hear that! and you’re welcome! Our family recently moved and downsized. I no longer have walk in closet. So even though I got rid of things before the move it seems like it wasn’t enough. I need to add shelving in my bedroom for books and underbed storage for shoes and creative storage for my clothes and paperwork. Amanda, I just subscribed to your blog. I saw you on Joni Table Talk, and I was so impressed with your story, and your love for the Lord that I wanted to join. And I discovered this post that was exactly what I needed right now. It was confirmation of what God has been working in my heart abut the importance of keeping my home. Thank you do much. Just seeing this. Thank you so much!